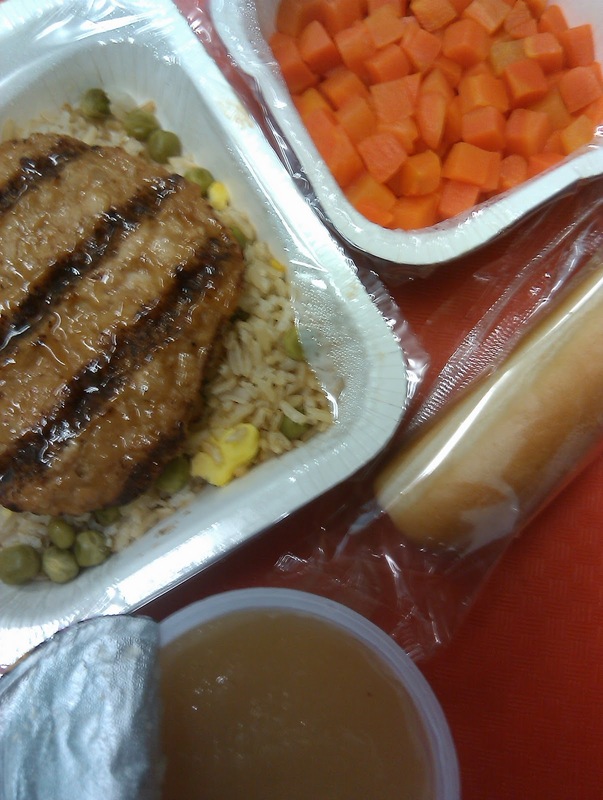 Chicken patty teriyaki is one of my favorite main dishes. I thought it tasted fine — definitely better than some of the other stuff I have eaten this year. I imagine that this would be one of the more expensive dishes compared to say the hot dog or hamburger meal because it contains more real chicken and there is also egg in the dish, which doesn’t appear in any other lunchtime meal. If you zoom in on the chicken patty, you can see that it contains more actual chicken than any other chicken patty I have eaten. 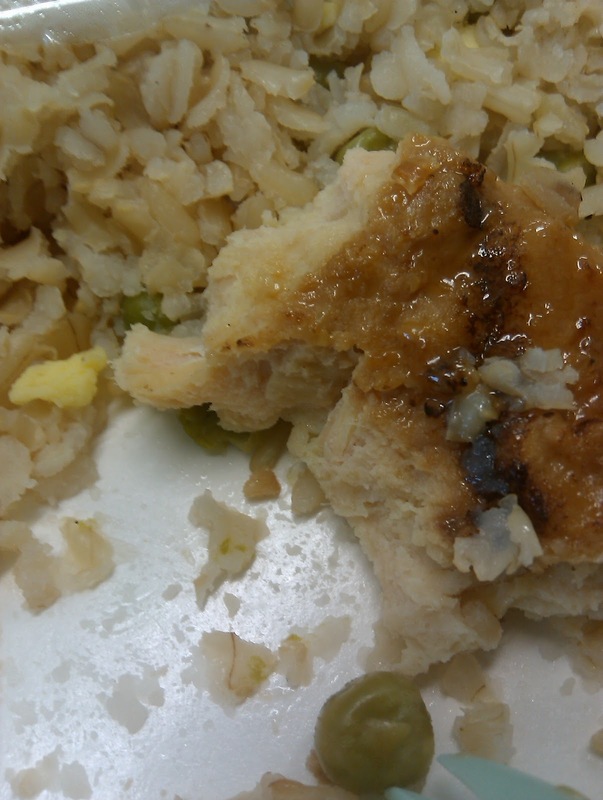 The texture is an interesting mix of real chicken bits and spongy interior (see second close-up). Today’s carrots tasted more like canned carrots than previous carrots have tasted to me. Because I ate a lot of canned veggies as a kid, I actually find that flavor comforting (oddly, I like the taste of canned peas too…) Mmmm, canned carrots, remind me of home and the 1980s…. I ate the applesauce, but not the breadstick…I know that under the federal guidelines the school district needs to offer two grains per meal, but a breadstick with rice is out of place. I just can’t be persuaded to think otherwise. And I can’t even persuade myself to take a bite of a bread product in a package. I hope you had a phenomenal Thanksgiving. It’s my favorite holiday because it’s all about food and pretty much non-political. Usually we went to my Great Aunt Alice’s here in Illinois for the holiday with my mom’s side of the family including her favorite first cousin and his partner from San Francisco (how much cooler can you be?). We chatted until our mouths went dry, laughed until our faces hurt from smiling, and ate until our bellies ached. I had my son more than two years ago and when he was almost two months old, Great Aunt Alice passed away. Thanksgiving had already been planned and plane tickets bought for the holiday but we didn’t know what to do. It wouldn’t be the same with her. Everyone including the Californians decided to go up to Wisconsin and make the best of it. We tried not to cry, but we were choked up pretty frequently. Thankfully my little baby made everyone smile and think of the possibilities of life. I hope that this past holiday you got the chance to lift your glass to toast the ones you love. I couldn’t suppress a laugh. Oh and yes, there is no art this year. There has been art on and off, but this year it was cut. That broke a lot of kids’ hearts. What is an elementary education without art and recess? (Full disclosure: my mom used to be an art teacher). Liz Snyder from www.ieatreal.com contacted me about an experiment she tried: The $2 Lunch Challenge, which was picked up by Civil Eats. She wanted to make good food at school lunch prices. So she made a week’s worth of lunches for her daughter at home. Each lunch was full of fresh, organic food for under $2 per lunch (not including labor) and she compared them to what I was eating. What a contrast! Next week I’m challenging you to pack a cheap, fresh lunch Monday through Friday, photograph it, and blog it and then link it up to my daily lunch posts all week. If you feel like you have the time to do a cost calc on each lunch, then go for it. I bet you can make it for under $2 just like Liz. As a teacher I pay $3 per lunch, but that is more than the federal reimbursement rate of $2.74 (at my school). If you don’t have time to do the math (maybe you have a screaming toddler like I do), don’t fret — just link up your child’s lunch. Let’s have fun with this! I guess my Weight Watchers Smart Ones won't count in the Eat Along/under $2 challenge, eh? As a music teacher in the Land of Lincoln, I sympathize with you. I luckily am still employed by a district that cares about a whole, balanced education. I hope for you and your students that you get art again. I also hope you have music too! We have music! Yes, it's a very good thing!! 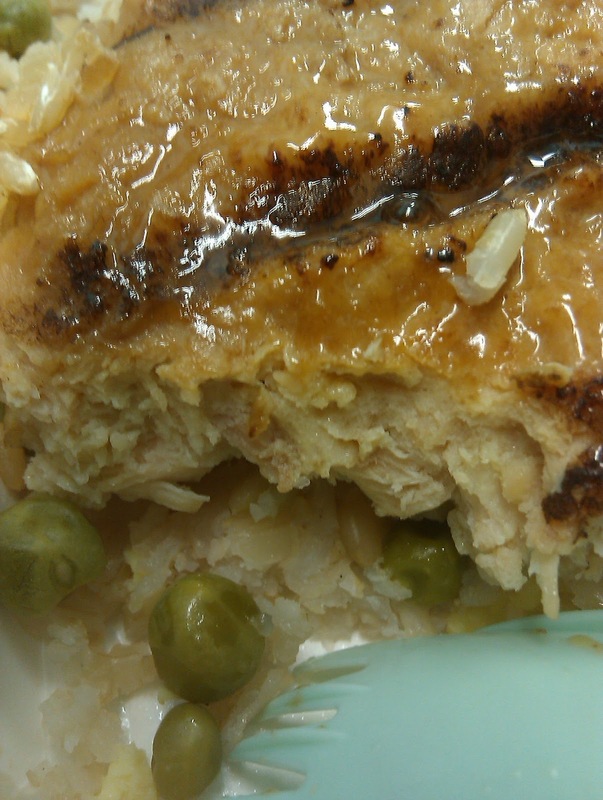 From a distance this looked like a decent lunch… but the close-up of the spongy chicken product is gross! OK, you say it was not as bad as some of the other chicken products you're had, so I will have to take your word for that. I don't blame you for not eating the bread tampon (hahaha!) Is it real crusty bread? Probably not; probably soft and spongy. is there *any* hint of teriyaki flavoring in that meal? I'm just curious. It's my favorite meal of yours too, because you usually get 3 different fruits/veggies, which makes it feel like there is way more variety in the meal than chicken nuggets, tater tots and fruit juice… Wait, did I say "makes it feel like there's variety?" I meant "definitely, unquestionably, without a doubt." Is this the first acknowledgment we have gotten of where you live? I can't recall any clues before this! Tantalizing…I'm also from Illinois and wonder if you're from the area I grew up in. That chicken likely came from spent laying hens, most of which are currently being diverted to the federal school lunch program. Older birds are tough so that's why they chop up the meat and glue it back together to form a patty. Spent laying hens used to be sold in supermarkets as stewing hens but you rarely see them anymore. They're great for soup, stock, and stews (e.g. chicken & dumplings) because although their meat is tough, stewing hens are more flavorful than the young hens that predominate in supermarkets today. I just shudder to think what chemicals and fillers were added to make the teriyaki patties and what chicken parts may have been included that you would normally discard such as cartilage, bone, and skin. Our nation's kids deserve better. I think it's fine to use spent hens for school lunches, but they need to be used in a different way. Instead of chopping them up and adding a bunch of unhealthy ingredients to make patties and nuggets, use the hens as they've traditionally been used by home cooks and chefs, i.e. in soups, stocks, and stews. I'm so glad to hear that your school has a music program, Mrs. Q! Music stimulates the same part of the brain that does math. Yeah math! I attended three different elementary schools and none of them had art. We did have music, P.E., and "library" though. . .and recess three times a day! I was a good student and very focused throughout the day, but I still appreciated the break that recess provided. I really feel bad that so many schools are cutting it out. It seems almost counter-productive. Breadstick and rice… As an Asian, that is a rather peculiar combination..
Debinoxford, I recall Mrs Q has dropped hints before that she might be in Chicago or somewhere in Illinois….. I almost cried to hear that a kid explained to a teacher what recess is. The most frustrating thing about teacher: not being able to change the things you know need to be changed. Like the no-brainers. Kids need recess, healthy food, and well rounded educations including specials. Unfortunately the "experts" that make the decisions didn't get the correct cost-benefit ratio on their spreadsheet. Do they have to have 2 different grains, or just 2 servings of grains? It seems it would make more sense just to have a double serving of rice. Make the whole thing a stir fry type dish. While I understand why you are choosing to not eat portions of the school lunches, I can't help but feeling that you are not living up the the promise to eat what the kids eat. That is what you started out to do, that is what you have built this blog around, and now I feel that you are backing off of that, because you "just can't make yourself do it". That's fine, but then you should change your slogan. You aren't eating what the kids eat- you are eating what you choose to eat from the options…. Music and art are great, but I think recess is more important. In my opinion, in the younger years, recess is more important than anything. I'd rather see less time spent on math and reading if it made the difference between recess or no recess. The idea of small children not being allowed to play for 6 hours a day is just wrong. For the $2 challenge, I love the idea, but the link states "When it comes to school food, it’s not really about the money – it’s about the mindset." The implication that labor is just a little thing you can easily dismiss really rubs me the wrong way. She wouldn't so easily be able to make those $2 lunches if her budget also had to pay cooks and servers (minimum wage at least). And don't forget serving utensils and trays and such. Either disposable or the initial purchase and then replacement over time of reusable ones. I'm not giving schools a free pass and I do think they could do better. Many have. But as much as I enjoy the $2 challenge link, the overall attitude doesn't appeal to me. I don't think it does anyone any good to ignore the issues and pretend it's as easy as changing your "mindset". I went to five different elementary schools in two different states. Some schools didn't have art class, but they all had recess. In some schools, we actually had two recesses — a short one, about two hours into the day (so ~10 am) to give us a breather, then the full one after lunch in the afternoon. Added to these were a weekly, formal PE class and occasional outside games when our main teacher felt like it. I don't have a child but I'm in for making cheap lunches! I'm shocked that schools don't have art and recess. Art was my favorite part of the day in school. Sometimes I feel like I need an art class to get away from the emails and excel spreadsheets at work. I posted my kids' lunch to my website. With drinks, a yogurt, some ham, cukes, bell pepper, strawberries and grapes, plus Feta cheese for my girl, and some crackers for both, I'm thinking they MAY have come to $1.50 each. Maybe. Probably not that much. It took about 2 minutes to make both lunches. Anonymous 7:57 – the exact requirements vary depending on age group and the menu planning pattern used by the school. In the school I work at, using the enhanced food based planning pattern, grades K-6, we need to offer 12 servings of breads/grains per week. One a day is minimum, but you can see it is likely to see more than one serving a day offered to meet that minimum. The serving size varies depending on the food item. For rice, 1/2 cup = one serving. Would one cup (to make 2 servings) be too much for a grade school child? Mrs. Q, I'm not quite sure what you are saying about the cost of the adult meals and the $2 food challenge. 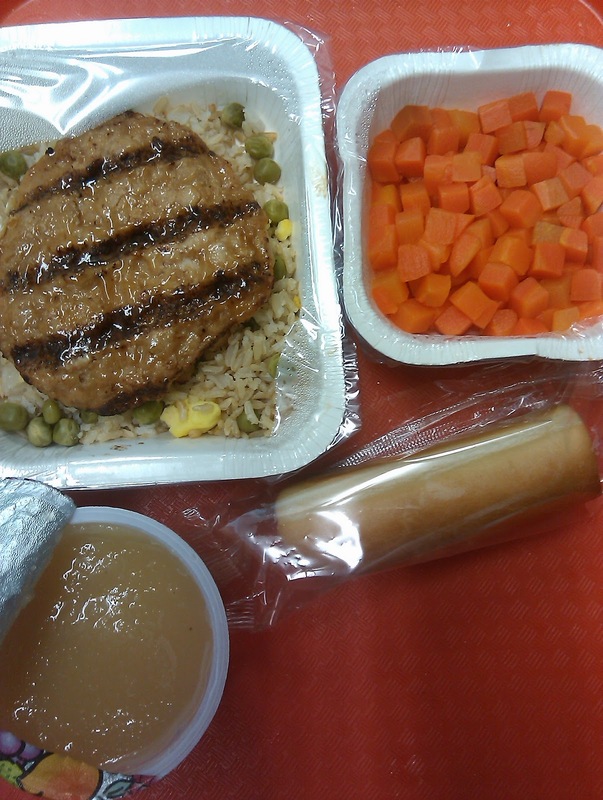 You know that schools don't get any funding (reimbursement) for adult meals? And while it's interesting to make a meal for $2, that's not an option that the school has. They DO have to pay for labor, utilities and so on. That raises an interesting point about labor. Are your lunch ladies/gents paid a living wage? Do they get benefits? What happens during school breaks when they are not working? It's an interesting challenge to attract employees to a job like that. Everytime you mention your elementary school not allowing for recess it shocks me like a slap in the face and brings me back to reality that school is nothing like it was 25 years ago when I was a child. I remember hot meals made from scratch, ovens in the kitchen, sweet and wonderful lunch ladies, and playing outside. We would run, climb, play foursquare, dodgeball, etc. Elementary school should and could be so much more than it is for our children. What I'd like to know, and maybe you've said before, did your school ever have "real" food, recess, etc? And if so, when did it change, and why? As far as I know, recess doesn't cost anything… So why in the world wouldn't your school's administration and the parents of the children there demand recess? As a mom to twin 3 year olds, I don't have much time left before they'll be off to school. I for one would be the first one in the door of the school office everyday until something was done about all of these issues, especially recess (since it's free). The fact of the matter is nothing is going to change at your school or any other school in America until parents and the administration join together and demand for better and more nutritious meals, art and music programs, recess, etc. ALL of us must come together and make our voices heard. We are talking about the future of our country here. Right now, so many schools are producing good test takers. That's it. As the daughter of an educator, I have seen and heard, first hand, how so much has changed in every aspect of education over the years. Unfortunately, it has not changed for the better. I am just glad to know that, slowly but surely, the word is spreading that something must be done. Maybe, just maybe, my children will be taught more than just how to take a test. I hope and pray they will have the same opportunities I did as a child, if not more. Fortunately, even if nothing has changed, they have two parents that will ensure they are eating right, playing outside and learning about the arts. Good job Mrs. Q… Let's keep spreading the word. Oh but Anonymous 7:57, that would require COOKING, and the higher ups who decide the goings on cafeterias simply CAN'T have that. It would make far too much sense. Instead they make their employees re-heat pre-packaged crap trucked in from another facility so that they don't have to pay as many employees, or employ them for as many hours, each day. So yeah, even though the single most logical thing to do would be to prepare a stir-fry dish in which the carrots, peas, and chicken are all hashed with egg and extra rice, that would require them to purchase actual stoves and sever ties with their precious food-supply company. And of course, we CAN'T have that. I wouldn't have eaten that imprisoned breadstick, either….not as an adult and most certainly not as a kid. you know… we talk about programs like art and recess and real food being cut because schools don't have the money… but what I don't quite understand is how schools are suddenly more expensive to operate than they were when we were all kids. What has changed? Why can we suddenly no longer afford paintbrushes, whistles and ovens? I agree with the people who point out that recess is free. And anyone who argues otherwise is going to have to give me a good example, because when I was a kid, recess was monitored by two groups: teachers and volunteer parents. There was no additional staff to pay. So what gives? In regards to the $2 meal challenge, I've noticed a lot of commenters are mentioning the absence of labour costs. The biggest hinderance, in my opinion, would be slicing food (oranges, stir-fry veggies, etc.) I know Mrs. Q has mentioned kids not having sufficient time to peel their oranges- is their any way that they could have the teachers stop by the lunchroom earlier in the day, then distribute the oranges, apples, etc. as a "snack"? Students could quietly munch while reading independently or watching a film. I know that, in elementary school, some students didn't have lunch until 1:00, while others ate at 10:30 in the morning! Perhaps spreading their "lunch" out would reduce waste and keep the students fueled throughout the school day. Also, without the temptation of cookies or chips, they may be more inclined to eat the healthy foods. Anyone with me? My daughter's school doesn't have art class, but somehow she still gets a grade for art on her report card. Baffling. They do have a 15-minute morning recess and a 40-minute lunch break, though. anonymous 7:47 – the cost of recess might vary depending on the school. I'd suspect many districts are like the one I work at. Teachers get a duty free meal break…which is only fair! But, that means they are not going to be supervising recess during the meal break. Volunteers…possible. If they show up. What is the back up plan if they don't show…will you have children at recess unsupervised? Safety? Are all volunteers going to be trained in first aid, proper training concerning students with special needs and so on. It honestly seems like nothing is simple! Volunteers were plentiful when I was in school. I got hurt pretty badly on the field once as a kid, and while the yard supervision staff weren't trained for first aid, they were smart enough to get the school nurse immediately. There were probably 5 – 10 people on the yard daily. I've never volunteered at a school, but I have done lots of volunteer work for other childrens' facilities, and you have a scheduled time and day in which you show up, and if you can't make it, you call in–just like a job. The supervisors when I was a kid merely provided a set of adult eyes to break up fights, watch to make sure no one got hurt, and enforced the school rules. It was good enough for kids 20 years ago–I don't see what's changed, other than sue-happy parents who are crippling schools by holding everyone but themselves accountable when their kids misbehave and get hurt as a result. I'd be willing to bet that if schools sent home sign-up sheets for parents to volunteer their time in order to reinstate recess, there would be a surprising number of takers.